NOTE: I wrote this game in January 2012, based on the early videos for Journey. I meant to update and expand it once I actually got to play the game, but that still hasn’t happened. In any event, now that Journey has won a bunch of awards, I thought people might be interested. 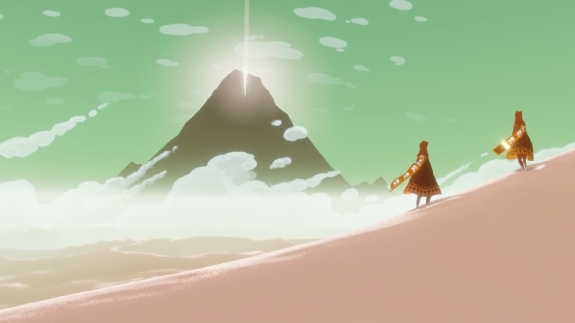 I may work on it again at some point (and it would probably be way different) once I actually get access to a PS3 and have the chance to play Journey. But now it’s like some weird outsider/dream thing, based on a limited understanding of what the game is about. 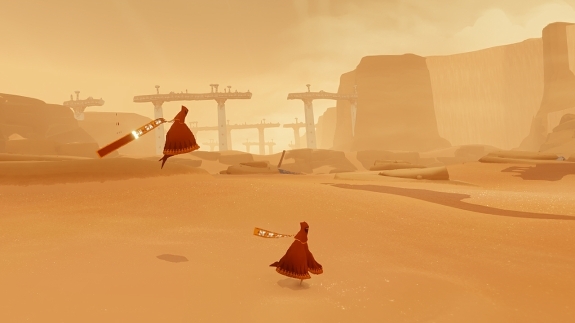 The super cool folks at thatgamecompany are preparing to release a new game called Journey. Alongside the games by Team Ico, this is one of those titles that — all by itself — justifies owning a PS3. I can’t wait to get a chance to actually play it and have been ravenously devouring video in the meantime. While these screenshots are stunning, they don’t do justice to the experience of the game. I suggest checking out some Youtube videos of the demo version (Part 1, Part 2) to get a better feel for what these folks have achieved. I can’t say enough good things about the stark simplicity and emotional depth that they’ve conjured together. In any event, I contacted thatgamecompany on Twitter in November 2011 and asked if I could make “an indie experimental analog tabletop game” inspired by their work. They acknowledged that Sony actually owns the rights, due to their 3-game deal (for Flow, Flower, Journey) but said “if you don’t sell it, you can still make it!” Yay for the collaborative, mutually-supportive indie games spirit, which is so evident in indie tabletop games as well. Here’s my sketch of the game, which will be updated and developed further in the future, especially once I actually get the chance to try it out with a friend or two. But it should be playable and fun as-is. Let me know if you play it! This draft is inspired in part by D. Vincent Baker’s excellent games Apocalypse World and Murderous Ghosts, conversations and 1-on-1 play with John Harper, and, of course, videos and stills from thatgamecompany’s Journey. Some aspects are eerily reminiscent of Caravan by Emily Care Boss, though I encountered that game later. Several concepts and mechanics are drawn from a couple of my unfinished design projects, Fingers on the Firmament and Super Suit. 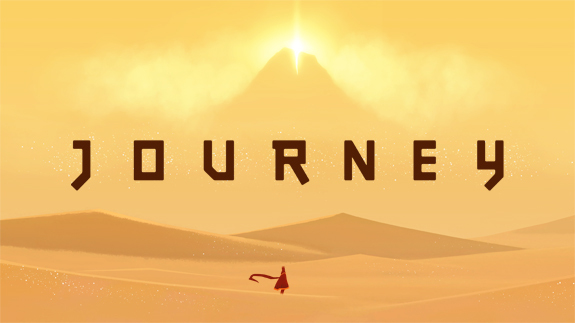 This game begins with just two players: one playing the sojourner and the other playing the journey. During the course of play, you may be temporarily joined by additional players playing other sojourners, but they are free to wander in and out of the game as they please. One important part of play is creating a map of your journey. Standard-size computer paper works fine for this, along with pencils or other drawing tools. You will also need two dice (the six-sided kind) and may also find it helpful to have a token or pawn to mark the current location of the sojourner on the map. An ocean of sand stretches out in every direction, its dunes rippled by the desert winds. Far in the distance, the sacred mountain looms immense and silent, a beacon of light shining brightly from the highest peak. Will you reach the summit? What might you find there? I walk steadily through the sands, my red cloak rustling against the breeze. I am human but with a bird’s nature, voiceless except for my song, which has no words; faceless and yet striking and beautiful. There are not many of us left, but we are on a journey back home, whether we know it or not. Will I make it there? Are we even welcome? And will the others join my pilgrimage or heed their own hearts? Take two sheets of paper: one will eventually become a map of the starting region (the necropolis, see below) and the other will become a map of the sacred mountain, far in the distance. Begin with the map of the mountain. The journey player should sketch out its basic shape and most prominent features, but strictly limit themselves to aspects that the sojourner can see clearly from their distant location. The sojourner player can assist by asking some questions about what they can see or suggesting features of the mountain that they can barely make out. Are these mirages, strangely-shaped shadows, or the truth? That will only be discovered as the sojourner proceeds closer and the mountain becomes clearer. Consequently, try to limit yourselves as much as possible, only indicating 2-3 vague features at this stage. However, be sure to clearly indicate which point is the summit, where the beacon of light ascends into the sky. The sojourner player should then draw the glyph that identifies them, their “name” of sorts, using it to mark their starting location on one edge of the other blank sheet of paper. If you have difficulty coming up with glyphs, I recommend borrowing them from the beautiful written language of the Yi. Next, the journey player should describe and sketch out a map of the first region the sojourner encounters, which can take up some or all of this sheet of paper. While the regions encountered later in the game will be different for every group of players, the first region is always the same: a desert necropolis of scattered ruins and countless grave markers. The journey player need not draw the entire region in great detail, at least not all at once. Instead, they should sketch out the major features that would be immediately noticed by a lone figure stumbling upon them after emerging from an ocean of sand: the largest ruins, rather than every block of stone or half-destroyed pillar, and even then just the basic shape of the most significant structures; major features of the landscape like sizable hills and valleys, rocky outcroppings, and waterfalls of sand; and certainly the larger fields of grave markers, some of which have red ribbons fluttering from them. You will add more detail to this map as the sojourner explores the region more fully. Critically, all regions in the game—including the first—are empty of living things, including other people, unless the sojourner or journey player invoke the rules for encountering another sojourner. When exploring a region of the map, the sojourner player describes where the sojourner walks and what they do, but can’t describe what they say (since they have no voice, just a wordless song) or what they feel. As the explore the region, they can ask the journey player questions about what they see, hear, or otherwise experience and the journey player responds, drawing additional details and features on the map or simply describing things that are too small or complicated to illustrate. There are several things that the sojourner player can do which break up the normal pattern of play described above. These things are called the “core moves” and generally work to push the game forward towards its ultimate resolution. However, it’s important to remember that move-less play—exploring and asking questions about what you experience—is critical for getting to the point where it makes sense to use a core move. It sometimes makes sense to “chain” a series of moves together, but the game should not always be a series of moves, but vary between making moves and exploring/questioning. All of the core moves involve the sojourner player doing something and the journey player making a judgment call about whether or not the sojourner’s actions initiate one of these moves. If so, follow the instructions for that move; if not, continue to explore and question until the conditions for one of the moves is met. If things become confusing or don’t seem to be going anywhere, stop playing and talk about it. the journey player describes and illustrates ruins which appear out of the dusty air or catch your attention; these ruins are not always directly in front of you, but may be off to the side or far in the distance; if the ruins are already on the map, illustrate or describe them in greater detail. this is a partially buried block of stone. this is a fragment of ancient architecture. this contains a stele or statue. this is a lesser ruin, containing some secret. this is a lesser ruin, but impossible to reach from the ground. this is a greater ruin, but impossible to reach from the ground. On a 5 or less: you find nothing but swirling sand. On a 6-8: you find red ribbons floating in the air. On a 9 or greater: you find silver cloth. Add +1 to the length of your tassel. If you have no tassel yet, your cloak grows a long tassel from the hood, which begins at length 1.
they gain a number of “float” tokens equal to the length of their tassel. On a 6 or less: the sojourner can float to any adjacent ruin. On a 7-9: the sojourner can float to any ruin currently on the map. On a 10+: as below or the sojourner can reach a previously unreachable lesser ruin. Sidenote on awakening ruins and what that might involve, being a fan of the player, and going with whatever they decide to do. The job of the journey player is to describe the things the sojourner encounters on their journey, not place difficult obstacles in front of them. Then again, not everything works on the first try. Find a balance that feels right. examples of new regions include the following (feel free to choose from this list or invent your own, based on what the sojourner has learned about these lands): the sanctum, the road, the shrine, the fortress, the village, the dry lakebed, the storehouse, the fields, the market, the city, the crossroads, the school, the caverns, the aquaduct, the tower, the quarry, the craftworks, the monastery. Eventually, of course, the sojourner will reach the sacred mountain itself. At that point, take the map you have gradually created of the mountain and use it as the map of the final region. If your map of the mountain has grown especially complex, it may even make sense to take out some blank sheets of paper and break it down into a few smaller regions, copying over the features and ruins from your existing map. 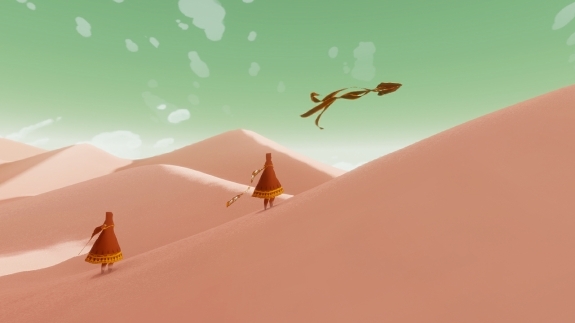 When the sojourner has reached the end of their journey (they decide): the sojourner player should take a few minutes and describe an epilogue for the game. Does the sojourner stay there? Do they depart for somewhere else? Both of those questions many not even makes sense anymore, depending on what the final segments of your journey are like. 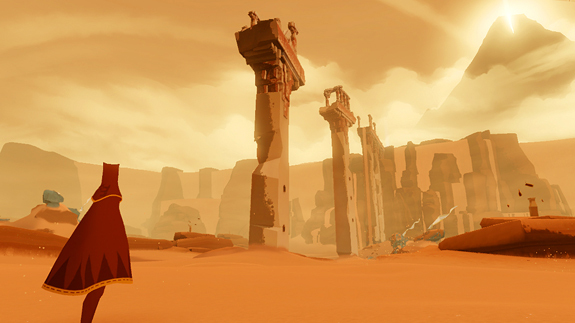 In response, the journey player describes what the sojourner sees in their last surveying glance across the landscape, from the desert necropolis to the summit of the sacred mountain, noting how the landscape has changed due to the journey.